I'm not crazy about steak. If I go to a nice steakhouse, I usually order fish. But every once in a while . . . girlfriend needs some meat! I went to Whole Foods and met a very nice butcher who explained this section of his display case that was a mystery to me. NY Strip Steak vs. Ribeye vs. Flank vs. Fillet. Thank you, Mr. Butcher man. (I decided on the NY Strip Steak.) To be honest, I didn't know you could cook steak in a kitchen. I thought you had to have an outdoor grill and very big muscles. (I have neither.) 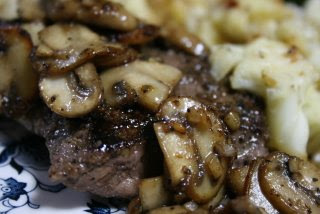 I found a recipe in Martha Stewart Living for Pan-Seared Strip Steak with Mushrooms. TOTAL COOK TIME: 20 MINUTES. Now we're talking. The whole thing was a huge success! Pan-Seared Steak with Mushrooms Prep Time: 10 min. Total Time: 20 min. Serves 4 1 tables spoon vegetable oil 4 boneless New York strip steaks (6 ounces each) 1/2-inch thick Course salt and pepper 1/4 pound cremini mushrooms, cut into 1/4-inch-thick slices 1/4 pound shitake mushrooms, cut into 1/4-inch-thick slices 1 cup chicken stock 2 teaspoons Dijon mustard 1 tablespoon parsley 1. Heat oil in a 12-inch skillet over medium-high heat. Season both sides of each steak with salt and pepper. Cook 2 steaks at a time for 1 1/2 minutes per side for medium-rare (Do not flip steaks more than once.) Add more oil if needed. Transfer to plate. Cover, and let rest at least 5 minutes. 2. Add mushrooms to drippings in skillet, and cook over medium-high heat, stirring occasionally, until tender, about 4 minutes. Add stock and juices from plate to skillet. Bring to a boil, scraping up brown bits. Stir in mustard, and simmer until sauce lightly coats the back of a spoon, about 3 minutes. Pour sauce over steaks, and sprinkle with herbs.